Not the least of my favorite things about Tinkerbot Games’ Ghostel is its ghost-shaped player pawns. 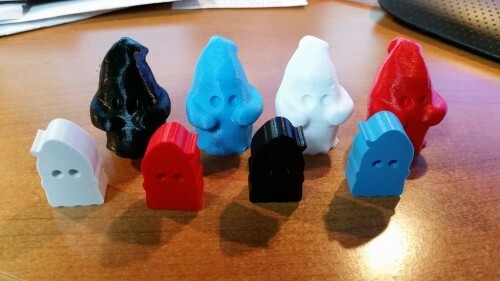 The 3D pieces planned for a stretch goal are wonderful but even the 2D ghost meeples are super cute! The game too gives me plenty to crow over, providing a nice balance of chance and tactical decision-making, as well as a wonderful representation of its light spooky theme. Each night round, the players as ghosts roll and distribute Terror Dice in an attempt to frighten away guests staying at their hotel. In every guest room a ghost visits, its player place’s one of their dice. At the end of the night, any guest who’s courage value is exceeded by the dice in their room runs away, and the players who contributed to that spook collect points. During the day rounds, guests who made it through the night recover some of their composure—dice previously placed in their room remain there but are reduced by one pip—and new guests arrive to fill up the empty rooms. The ghosts, of course, are not active during the day but their players then have an opportunity to spend previously earned points on Scare Tactic, Terror Bonus, and Spookie Favor cards. Though earning up the most points is the way to win the game, spending them judiciously can provide significant advantage. Scare Tactics allow players to trigger guests’ phobias (such as snakes, spiders, and clowns), doubling the value of a die as they place it. Terror Bonuses give players extra dice to roll. And Spookie Favors are special one-time tricks, like walking through walls (which allows a player to move their ghost piece anywhere on the board) or the chills (which gives a guest every phobia at once). In the end, Ghostel is super-easy to play, though also just a bit challenging turn-to-turn. The kind of game I love, where you can blame the dice if you lose but still have lots of opportunities to make the most of them during play. To help fund Ghostel on Kickstarter, as I hope you will, a copy will cost you £29 (approximately $41). 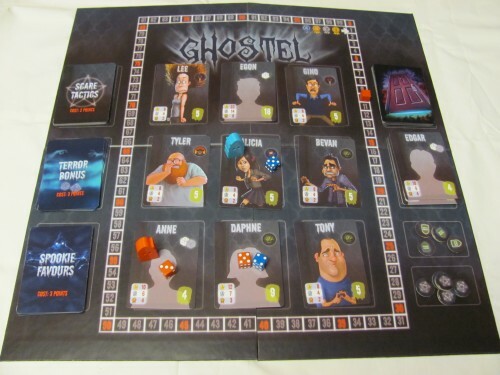 A complimentary prototype copy of Ghostel was provided by Tinkerbot Games for review.